I don’t want to pull back the curtain on this whole DALS thing too far, but that’s a question you hear a little too often around our house, at about 10:00 at night, when the kids are in bed and one of us is sitting at the kitchen table, trying to write 400 words about baked potatoes or 7,000,000 words on, gulp, a freakin’ chicken salad sandwich. (Not that we’re complaining.) What’s my angle? What’s my point? What, exactly, am I saying about this plate of food or that pile of children’s books? This is what I asked Jenny last Sunday night when she informed me I would be posting, in the coming week, about the meal we’d just eaten. We used to make this all the time before we had kids. You can do it with red potatoes or Yukon gold potatoes — we even used to mix in some sweet potatoes, too. Hard to go wrong. If you have a mandoline, you can use it to slice your potatoes nice and thin, about the thickness of a quarter. If not, a sharp knife will do just fine. If you want the full treatment, use cream instead of milk. Grease 9″ pie dish or casserole with olive oil or butter, and set aside. In a small bowl or measuring cup, whisk together flour, cayenne and milk, and set aside. Arrange sliced potatoes neatly on bottom of dish, then a few onions, in one layer. Sprinkle with salt, pepper and a handful of each cheese. Repeat three times: potatoes, onions, cheese, reserving a little cheese for final layer. Pour milk mixture evenly over the potatoes. Top with shredded cheese and salt and pepper, and cover with foil. Bake at 425° for 40 minutes. Remove foil, and broil for 5 minutes, or until cheese gets slightly brown and bubbly. Mmmmmm, I remember that warm Sunday dinner coziness from when I was growing up. I’ve gotta preorder Jenny’s book and get that meatloaf recipe! i love the meatloaf teaser too. 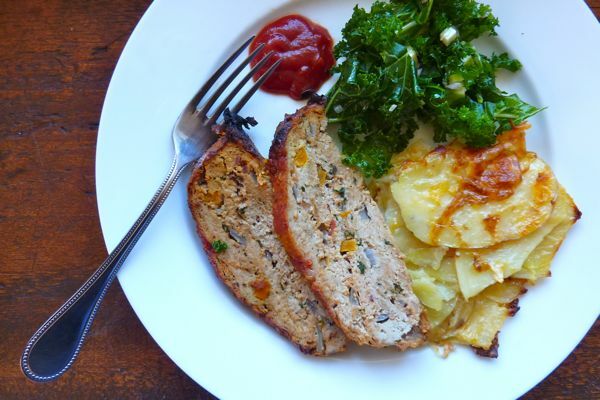 And FYI – The photo above is turkey meatloaf, the recipe in the book, Andy’s mom’s, calls for beef. Either way: killer. Sunday dinner does bring up all sorts of fond memories and a desire for a hearty satisfying food (aka comfort food). Lately we have been eating lots of roasts with roasted vegetables and gravy on Sundays… we have been blaming it on Downton Abbey. This meal looks absolutely perfect! Growing up, we sometimes we had a roast waiting in the oven, thanks to the new fangled circa 1968 oven timer. Other times we stopped for sandwiches at the country store on the way home from church (doughy white rolls, roast beef, salt, pepper and very little else). But always Sunday afternoon was all about Science Fiction Theater and awful-wonderful classics like Day of the the Triphids. I think maybe your meatloaf and cheesy potatoes are the healthier option. Can’t wait for the book to come out. I am a HUGE fan of Sunday dinner. Although I’m also a huge fan of ‘comfort food.’ To me, they go hand in hand – something to take the edge off the approaching Monday morning rush. OMG! I haven’t had potatoes like that in a long time. I know what I want now. Although we’re Sunday soup people. Tonight’s soup is Chicken Tortilla soup. I roasted a chicken this morning to use the breast meat for the soup. Can’t wait. Although now I see how I could make those potatoes and have it with the chicken. Maybe we’ll do that for the leftover chicken tomorrow. Your dinner looks so delicious and well balanced. I just had dinner but your plate is making me hungry. Love your Potatoes au Gratin recipe. AND THANK YOU! I was going to search for an au gratin recipe for Easter and you solved that issue for me here. 🙂 Yeah. Made the potatoes on Sunday–LOVED. Felt less guilty using milk and it was every bit as delicious. Only thing…I used half the cayenne and it was still too spicy for the kids….is it really meant to be 1 tsp? Lisa – A good point about the cayenne. I think you can go anywhere from 1/4 to 1/2 and be good. We adjusted above. Thank you so much for the feedback! I’m looking for the meatloaf recipe in the book, but only find your friend, Emily’s, recipe (page 20) Is there another one in th book? I want the family hand-me-down recipe! i made these potatoes last night–a weeknight!–for my husband’s birthday (along with a steak and salad). it was a huge hit with my husband and child. definitely putting this one in the “keeper” column! also would like the family meatloaf recipe, but i have enjoyed the one from the book (emily’s).